here will always be those who doubt ability to assess and differentiate audio devices by listening to them in controlled environment and comparing them with others. That's human nature – many people won't believe something until they have touched it themselves. But comparing different audio devices is a very good way to assess them. One should listen, compare and draw one's own conclusions – that's what our hobby is about, that's the best way to go about it. So one might think that it should be a natural approach for sound and audio engineers, too. After all all of them create products (music or devices to reproduce it) to be used by people in their homes. But as it turns out it is mostly a wishful thinking, that has almost nothing to do with a real world. I've been receiving many emails from either engineers or future engineers that prove beyond doubt that these experiments (listening and comparing) are never performed by them, even talking about it makes some of them anxious. Basing on a knowledge from their books they negate a precision of such comparisons, and claim that the only way to assess audio device is to measure several parameters. The whole history of science, also its electric and electronic branches shows, that very often it was an experiment that lead to formulating some theory and later adjusting it if needed. Such experiments were repeated many times and if the results were not consistent with theory, it was either rejected or modified. This method always drove progress. It happens that some engineers who write us at „High Fidelity” are able to accept my point of view and allow experimenting, but they believe that results of these experiments are pre-determined as they must confirm their knowledge and their experience. The assumption that man's hearing is a very special tool that can be used to access sound is, for them, unacceptable. Ears are such terrific pattern finders that scientists are using audio data to detect cancer cells and particles from space. As it turns out hearing is one of the most precise human senses because, according to Bechara Saab, a neurologist from Zentrum für Neurowissenschaften Zürich, when it comes to mammals signals from ears reach brain faster than perceived by any other sense, and our hearing is supported by, so called, Calyx of Held which is a particularly large synapse in the mammalian auditory central nervous system. This confirms what many audiophiles already knew very well – listening session might deliver very precise data, that, if correctly interpreted, allow a very accurate assessment. If it could be done by taking measurements it would be perfect obviously. It would allow to eliminate a “human factor”, or, above mentioned, interpretation, or personal predilection. Unfortunately there are still many issues in audio that are still not properly explained nor understood, many things can not be measured, and even if they are measured we don't really know how to correlate results and how to interpret them. Thus many audio products are still assessed using listening sessions. There is no better example of the conflict between common knowledge and what audiophiles learned through experience, than assessment of power cables. 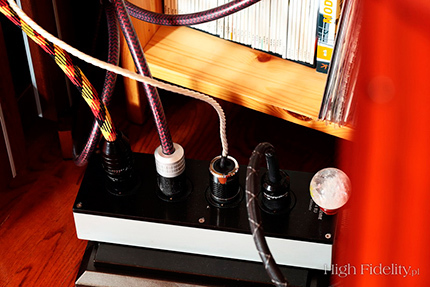 A common consensus that power cable is the most important one in the system, because it delivers current for speakers (signal from a source is just a “pattern” that modulates current and voltage from power outlet) does not really translate into appreciation of its role. And my experience proves that power cables can change sound of the whole system in the most incredible way. 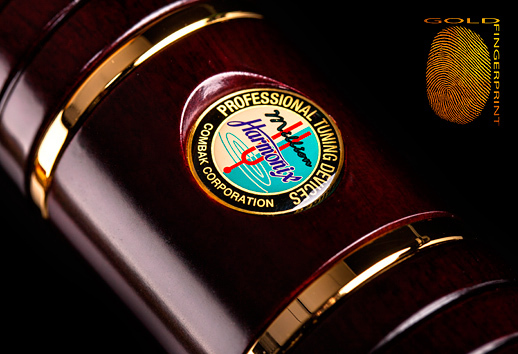 Recent years brought a fast evolution of this branch of audio industry. More and more companies realize how important are power cables in shaping the performance of their products, so companies that design and manufacture such cables offer more and more refined models. Even such hardliner engineers working for companies manufacturing interconnects and speaker cables (like Chord for example) started to appreciate the role of power cords and today they are even convinced that PCs are key to the top performance of audio systems/elements. As a result of this shift of attitude more and more money are spent for development of more refined power cords. I've been using Japanese Acrolink cables for years. This company makes cables for hospitals, army and even NASA. Each time new top model is released it replaces the one I've been using so far. Today I use 3 Mexcel 7N-PC9500, that replaced previous model called Mexcel 7N-PC9300. For the past 6 months I've been using also very expensive, top model from Crystal Cable, called Absolute Dream. It is made of silver and gold. These four are not the only power cables in my system. I use also a few Oyaide products from the new Triple-C FM (more about this technology HERE) line, and for quite some time I've been using also another cable from Japan, made by Mr Kazuo Kiuchi's company Harmonix – X-DC350M2R Improved-Version. It looks like a cord for some household appliance, but it is a very special product. I bet you know about Mr Kiuchi, but in case you don't have a look at the review of his another product, a D/A converter DAP-999EX Limited released by his another brand, Reimyo. In this text you will find some basing information about this man and his idea for an accurate sound. You will learn that Mr Kazuo, who is one of the greatest masters of Kendo, a Japanese martial art, is also a co-owner of XRCD patent – a breakthrough technology that allowed Compact Disc, for the first time in history, to offer sound quality similar to the one of vinyl record. Kiuchi-san is also a producer of many XRCD24, including the whole series of Hi-Q Records. The whole process of creating XRCDs is divided into few steps, from A/D conversion, signal digital filtering (K2, and nowadays K2HD), and pressing of the discs. All the devices used in every of these steps uses Harmonix cables. Celebrating company's 20th anniversary Mr Kazuo Kiuchi prepared a limited edition of cables called „Million”. Art Tatum, Piano Starts Here, Columbia/Sony Classical 97 22218 2, “Zenph Re-Performance”, SACD/CD (2008). Diana Krall, All for You, Impulse!/JVC 532 360-9, XRCD24 (1996/2010). Grateful Dead, The Best of Grateful Dead, Rhino 2795598, 2 x HDCD (2015). Jack de Johnette & Foday Musa Suso, Music From The Hearts Of The Masters, Golden Beam Productions GBP1112, CD (2005). John Foxx, The Virgin Years 1980-1985, Metamatic Records META52BX, 5x CD (2014). Krzysztof Komeda, Ballet Etudes/The Music of Komeda, Metronome/Be! Jazz Records, BE! JAZZ 6087 CD, CD (1964/2014). Nat ‘King’ Cole, Penthouse Serenade, Capitoll Jazz/EMI 94504, “Super Bit Mapping” CD (1952/1998). The Montgomery Brothers, Groove Yard, Riverside/JVC, JVCXR-0018-2, XRCD (1961/1994). The X-DC SP Million Maestro cable belongs to the top line of Mr Kiuchi's products. A year ago it seemed that it would never come to Poland – that's one of the most expensive cables in the world, a limited, handcrafted edition. 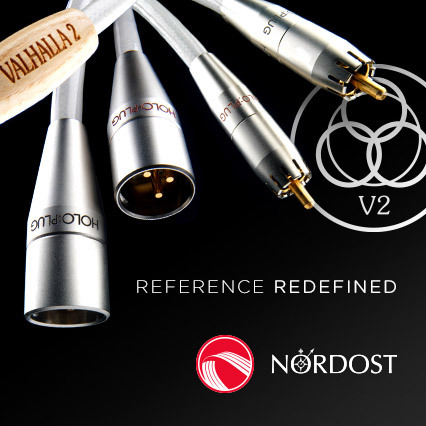 Polish market must have been developing and “maturing” really quickly recently as more and more most expensive audio product are now available here, some of them even premiered in our country. That's what happened with many Acrolink products, that's also a story with Siltech Triple Crown interconnect (currently under review), also Ayon's S-5 network player working in DSD-direct mode premiered in Poland (see HERE). 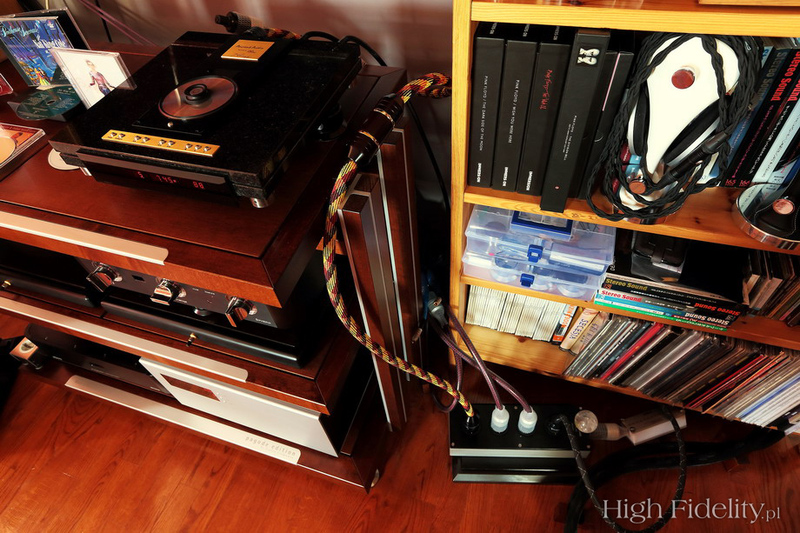 The most compelling example was priced at 135 000 GPB British amplifier, Naim Statement (review for „EnjoyTheMusic.com” HERE, and „High Fidelity” HERE) as we conducted the very first review, way before any other audio magazine in the world. Mr Kiuchi's cable finds itself in a particularly noble company. What is really important is a broader context. As I already mentioned, I am a great fan of Acrolink products, I also have a high regard for Crystal Cable brand. I know, like and use their top models in my reference system. What's more, each time I have to replace one of these elements that I feel so connected to, I feel frustrated and irritated. These cables play a double role: they are tools that I used in my everyday work, but they are also an important element of my life that revolves around music. So when comparing other cables to them I need to take into consideration how used I am to particular properties of my favorite cords (I mean both – their pros and cons). When I started to listen to the new Harmonix I soon found out that in this particular case the above mentioned reservation wasn't needed. It offered clearly different sound than any Acrolink or Crystal Cable I compared it to. The key difference was the richness of the sound. It took me quite a while to conclude that the difference was most significant in the lower midrange that sounded much richer.